Keep your left foot away from the clutch except when it is explicitly called for. I hovered my foot above the clutch and was called out for this during two attempts. Furthermore, do not put the clutch in while braking. This was a bad habit of mine: When coming up on a stop, I'd put in the clutch and then brake. The proctors want you to use the power of the clutch to slow the car down, all the way up to the moment before you stop. When shifting, make the movement quick and fluid. 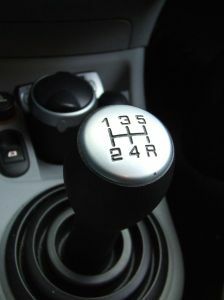 As soon as the car is in gear, get your left foot away from the clutch again. In Japan, drivers do not have to stop at intersections unless signage explicitly calls for it. This means at most intersections, you'll turn without stopping, and therefore your foot should be far away from the clutch. During the crank and the s-curve maneuver, it is acceptable and expected to use a half-clutch motion as you guide the car slowly through the turns. Keep your left foot pressed lightly on the pedal during these, keeping the clutch in its sweet spot. These tips all mean that you'll be flirting with a stalled engine during parts of the test. Get used to this as you practice--it's exactly the way the proctors want you to drive. The clutch should only be in during shifts, just soon enough to keep the engine from stalling, or during the crank/s-curve sections of the test. Stalling the car is not in and of itself a failing mistake. But, it will cost you a few points. Stalling two or three times will probably cause you to fail. Finally, keep the car in the highest gear possible for your current maneuver. That means for most of the course you'll be in second, and on the outer ring you should be in third or, if you can, fourth. what do intersections in japan have to do with driving a manual in the united states? Well... nothing. I think you found your way here by accident.